Cam's Cinematic Episodes: Film Review - WHATEVER WORKS: Big Laughs In The Big Apple, Woody Style. 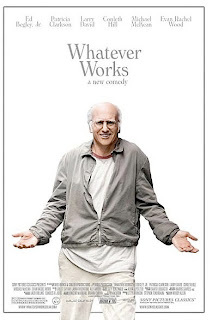 Film Review - WHATEVER WORKS: Big Laughs In The Big Apple, Woody Style. 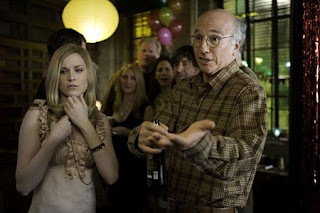 Whatever Works is a charming trifle, a return to the magical fantasy-land that is Woody Allen’s New York. Here, even the most cynical of hearts can be vibrantly reawakened by splendorous art, majestic architecture, stimulating conversation, and cosmopolitan culture. Having visited so many memorable times before — this is the director’s 45th film after all — the final results are like cinematic comfort food, lulling us into a warm state of contented delight. As Sam Raimi proved earlier this summer with his return to form, Drag Me to Hell, it is sometimes a joy to simply sit back and watch a master run through the basics with a practiced panache. 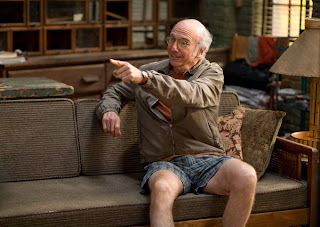 If the film feels fresher than it should (the script, as has been heavily reported, was actually written during the ‘70s with The Producers star Zero Mostel in mind), cr edit has to go to ingenious decision to cast Larry David as the film’s archetypal Woody surrogate. As the pioneering and creative mind behind Seinfeld and HBO’s painfully funny Curb Your Enthusiasm, David is taller and wirier than Allen. Although he occupies a much darker realm of neurotic misanthropy, his rapid-fire bursts of droll malice make Whatever Works feel alive and occasionally risky. Few performers could get away with dropping distastefully bitter bon mots about suicide, the Holocaust, and abortion without forsaking the audience’s sympathy, but David — who possesses no formal acting training — is a naturally charismatic and fiercely intelligent personality. He’s like the outspoken, caustic uncle who enlivens even the dullest family gatherings, but equipped with better writers. David’s character, Boris Yellnikoff, a once-brilliant physicist who repeatedly claims to have been “considered” for the Nobel Prize, exists in a constant state of existential angst (“I’m dying! I’m dying! Not now, I mean eventually!”) and OCD-type obsessions (compulsively singing “Happy Birthday” twice while washing his hands.) 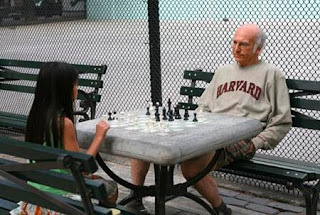 Crippled after a failed suicide attempt, Boris wastes his time mocking the world’s endless population of “cretins,” “microbes,” and “inchworms,” as well as giving confrontational chess lessons to oblivious adolescents. Returning home one night to his eccentrically ramshackle apartment, Boris fortuitously meets a young Southern runaway who bears the cumbersome moniker of Melodie St. Ann Celestine. Played by the multi-faceted Evan Rachel Wood, Melodie, after much doe-eyed finagling, manages to talk her way into both a temporary hom e on the old grouch’s couch, and a tutorship of Boris’ own disillusioned brand of worldly education. As time passes, and love blooms — portrayed off-screen, thankfully — the mismatched couple find themselves visited by the girl’s recently-separated and dysfunctional parents: flighty Southern belle mom, Marietta (Patricia Clarkson), and bible-thumping, NRA-member father, John (Ed Begley Jr.), who both demonstrate little approval of their daughter’s pompous beau. However, as the Big Apple begins to weave its tantalizing spell on these sheltered misfits, inspiring transformation and revitalized vigor, Boris, against his obstinate will, becomes progressively more and more compelled to reassess his ‘to-hell-with-humanity’ theories of life. Although Allen doesn’t explore the curious nature of Boris and Melodie’s May/December romance with a f raction of the perceptive zeal afforded to the mismatched coupling at the centre of 1979’s Manhattan, he still manages to mine great comedy from his two wildly contradictory stars. Evan Rachel Wood has proved herself to be a great dramatic actress on multiple fronts (as witnessed in Thirteen and The Wrestler), but here, she exposes herself to be a gifted comedienne. Her Melodie character hides under a cloak of cheerfully deceptive naivety and is a vivacious source of life as well as an enthusiastic sponge for information. There is a scene in the film where she sits, deeply contemplative and attempting to analyze the intricacies of Beethoven’s Fifth while someone knocks on the front door, that is a mini-masterwork of slow-burn hilarity, with the actress essentially delivering a flawless silent film-style comedy routine. Likewise, her scenes with the brilliant David — wherein she matches his scornful disdain with bubbly ‘head-above-the-clouds’ optimism — are Whatever Works’ most entertaining selling point. Unfortunately, the film loses track of itself when the focus shifts away from these two bickering companions and onto the supporting characte rs. While Patricia Clarkson’s Marietta is a keeper (her character’s bizarre journey into the unbridled wilds of New York bohemia is a riot) Begley’s John feels undeveloped and contrived. His metamorphosis, handled in a single scene, feels perfunctory and hollow. Additionally, Henry Cavill, as a somewhat creepy potential suitor for Melodie, is a bland, uninteresting pretty boy-type who actually manages to make Boris seem like the more appealing option. If it all wraps up just a little bit too nicely, considering the antagonistic tone of the central character, we reflect that it is sometimes nice to just watch love conquer all and leave the complications of reality behind. Allen argues that we all deserve happiness — even cranky old Boris — and should be thankful for discovering ‘whatever works’ to help us escape the annoyances of modern life. And, for the film’s 92 minutes, we are. *Originally printed in SFU's The Peak: July 13th, 2009.